Istanbul, Turkey -- I just experienced the blessing of visiting Iran for the first time. Here are some things I learned. 1. If you are visiting someone's office and you appear very sleepy, you may be asked if you want to take a nap. If you say yes, a comfortable place to take a nap may be immediately prepared. I want to state categorically for the record that no country in which you can take a nap any time you want should ever be bombed by anyone. 2. Any American who wants a hero's welcome in Iran right now should compare the Saudi bombing and blockade of Yemen to the Israeli bombing and blockade of Gaza. An American sporting a "Saudi Arabia = Israel" button could get invited to any party in Iran right now. 3. There is a tower in the middle of Tehran from the top of which one can see the whole city. Wow! Which way is north? The mountain with snow on top. 4. If you hang out at the top of the tower, little Iranian schoolgirls may greet you in English and then run away tittering, as if they've just proved their bravery on a dare. What a delight! 5. 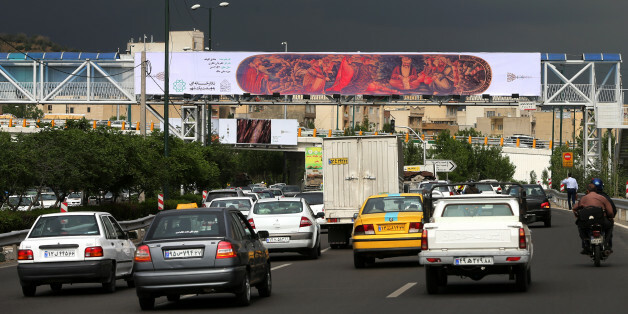 Drivers in Tehran need never fear that another Tehran driver will "cut them off." The reason for this is that the concept of "cutting someone off" apparently does not exist in Tehran driving culture. That which might be characterized as "cutting someone off" on an American street is apparently 100 percent normative Tehran driving behavior. However, unlike Cairo drivers, Tehran drivers do apparently believe in the existence of stoplights. 6. Tehran taxi GPS: ask any available pedestrian for directions, including small children. Repeat as necessary. 7. Counter-intuitively, taking a taxi from Isfahan to Tehran can take almost twice as long as taking the bus. See #6. 8. There is a Jewish community in Isfahan. Who knew? Maybe that's why the locals say Isfahan nefse jahan, "Isfahan is half the world." My French traveling companion and I visited a local synagogue. My companion thought it might be a profound souvenir to purchase a mezuzah produced in Isfahan. When queried about this idea, the woman who appeared to be the day-to-day boss of the synagogue asked - quite sensibly, I thought - "Don't you have mezuzahs in France?" 9. If the imam at Isfahan's Islamic Technical University finds out that you are Jewish, he may ostentatiously kiss you on both cheeks in front of the congregants. What a delight! 10. Students at Isfahan's Islamic Technical University aren't the least bit shy about aggressively questioning a speaker during a presentation. When the translator told me that I sounded to the students like John Kerry, I said: listen, I was for diplomacy with Iran before John Kerry was. I am not copying John Kerry; John Kerry is copying me. When I said this, the students laughed without waiting for the translation into Farsi. Aha! I said triumphantly. So you do understand English! 11. A diligent and persistent American tourist can, in fact, find t-shirts in the bazaar that have both Farsi and English. Richard William Murphy walks the talk on engagement. He agreed to debate me on Press TV regarding the Camp David summit between the US and Persian Gulf Arab monarchies. When Ambassador Murphy complained that Gulf Arab monarchs still felt aggrieved that during the Iranian revolution Iranian leaders had called the Gulf Arab monarchs "blasphemous, incompetent, and corrupt," I noted that while on the charge of blasphemy, the US has no dog in that race, it is a commonplace observation in the US that the Gulf Arab monarchs are incompetent and corrupt, including among US government officials. When he complained that Iran was "destabilizing" the region, I asked him if it was an example of such "destabilization" when Iranian and Iraqi government officials joined together to complain that the Saudi assault on Yemen blatantly violated international humanitarian law. 13. Cappucino at Imam Khomeini International Airport: just don't do it. I'm afraid that they have not yet received the memo. Stick to tea, a local specialty, where the locals have the comparative advantage of hundreds of years of production experience. The Iranians responsible for enriching uranium have nothing on the Iranian tea producers.